You can get many years of joy out of your new pavers. Between each paver is a gap that is filled either with sand or sand with a binding agent ( polymeric sand ), this keeps the pavers snuggly together and helps to keep out weeds. Over time the sand in the gaps may wear out with the weather ( rain, wind, freezing and thawing). When this happens you may experience weeds, mold, and fungus growing in the gaps. We would love to come out and evaluate your situation to clean out the gaps to replace it with what is needed. In the above image a drain is filled with sand from between the pavers. 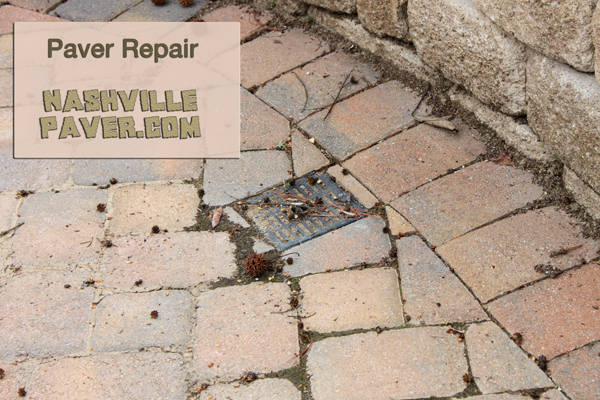 Maintaining your paver patio is critical to being able to enjoy the value from your purchase.